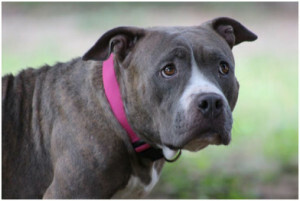 We didn’t quite understand just how bad her past must have been until we got her home. She must have never been inside of a home before because she showed signs of fear and anxiety towards just about everything at first (the first time we left her alone in a room she had a panic attack and chewed up a dress that was draped over the bed). She would go running if the door got closed to hard or if you raised your voice for any reason. Yet, through all of this she still managed to be the sweetest dog we had ever met. She wanted nothing more than to be by our sides (or in our lap). She was also one of the most caring and nurturing mothers, always keeping a close eye on her puppies and tending to them whenever they started to fuss. She must have known we were there to help because she allowed us to do just about anything to the puppies including giving medications. Because of all of these things, we decided to name her Mama. After 3 weeks of helping her raise her babies it was time to let them go to their forever homes. One by one all 5 of them found fantastic homes, but we still had Mama. We had her up for adoption, but decided that we couldn’t see our lives without her, she was part of our family. Mama got along with all of our other dogs, loved the kids in the family, had quickly learned the house rules, and just seemed to fill a hole in our family that we didn’t even know we had. We officially adopted her in August 2014. We knew we still had lots of work to help her acclimate and become a confident dog. She had a fear of brooms, the vacuum cleaner, the blender, laundry baskets, boxes, being left alone, being outside by herself, and doors moving just to name a few. Slowly but surely we were able to get her over her fears and learn that life inside of a home isn’t so scary and also that we had no intention of locking her outside. Through all of this work we started to see just how amazing Mama is with people and other dogs. 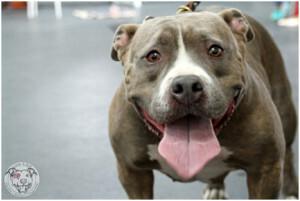 She loves people of all shapes, sizes, and ages and enjoys the company of other dogs! Her famous way of showing that she wants to meet someone is by wiggling her whole body until they give her attention. Mama’s other favorite activities include Backyard Squirrel Patrol, helping to prep dinner by “cleaning up” anything that is dropped, napping, and romping around with her 4 other dog siblings. As time passed it was mentioned to us that she would be a great therapy dog, and since she has never met a person she didn’t like we figured we’d give it a shot. The first step was working towards her Canine Good Citizen certification and on November 11th, 2014 she passed her test and was officially certified. 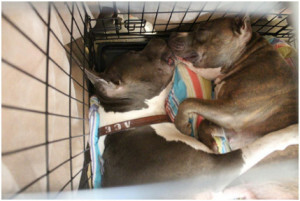 Soon after, it was time for the next step– Love-A-Bull’s Pit Crew Therapy Dog Program! Just before we could make much progress in her training, Mama has a leg injury and was out for surgery. But we didn’t give up there, we took this time as an opportunity to work at home with to prep her for classes. Slowly but surely she started to get over her fears of these things and by the time we were able to join class again she was comfortable doing things like walking alongside a wheelchair and greeting a person with crutches. 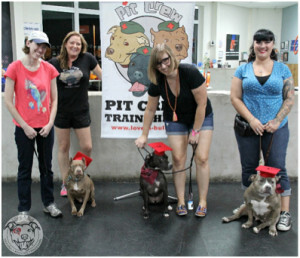 We started the Love-A-Bull’s Pit Crew training with Crystal Dunn on July 2015, and through a lot of work and dedication, she became a certified therapy dog on August 30th 2015! So, in one year’s time, Mama went from homeless on the streets with 5 puppies to a proud graduate of Pit Crew. Proving once again you can teach an “old” dog new tricks! 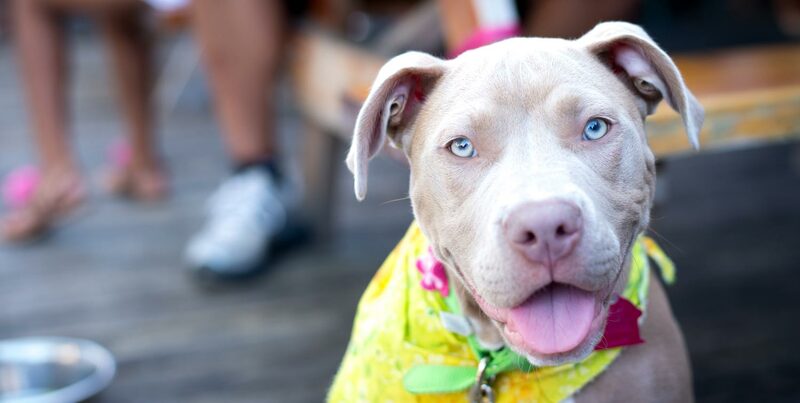 Mama is an inspiration to us every day and a tribute to just how forgiving and loving a dog can be! We love you Mama Girl!